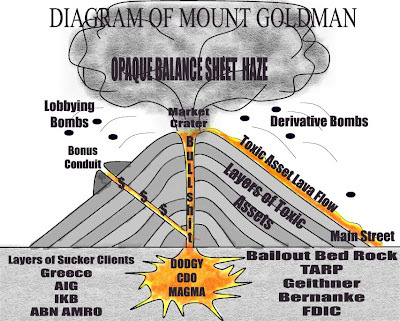 The Automatic Earth is one of my favorite sites and this post on Goldman is an example of why. Ilargi: Haven’t read enough about Goldman Sachs lately? So where is Andrew Cuomo when you need him? Wait a minute, New York's Attorney General is running for governor, in daddy’s footsteps, isn't he? That probably answers my lingering question as to his silence so far in the SEC vs Goldman Sachs case. After all, it’s not like he needs more than the weekend to read up on it, the entire case as filed on Friday comprises a grand total of 22 pages. More on that last bit in .. a bit. There's some curious things about that SEC case, like who’s actually charged with what. There's no Jonathan Egol, Fabrice Tourre’s partner at Goldman, no hedge funder John Paulson, no Goldman CEO Lloyd Blankfein. Instead, the only person the SEC names -far as I've seen- is Fabrice Tourre, who, at the time the Abacus deal involved played, was all of 28 years old. That age thing keeps on itching me. It somehow points to the degree of involvement of the likes of Blankfein, Goldman president Gary Cohn and CFO David Viniar. These guys don’t let a mere kid play with billions of their capital without keeping a close watch. They were all down there on the trade floor for extended periods of time, figuring out what exactly transpired, as can be proven. How about joined at the hip with the SEC? Has SEC COO And Former Goldman Employee Adam Storch Recused Himself From The Investigation? This should be posted in every newspaper blog section across the country.